Canada was a major driver of intermodal growth with total loadings originating in Canada rising almost 12% in 2017. Domestic container shipments grew much slower, increasing only 2.7% for the year. It was the first time since 2010 that domestic volume growth lagged behind international, a situation caused, in part, by a shortage of equipment, IANA reported. Intermodal shipping companies say they expect demand to remain strong in 2018 because of tighter truck capacity and higher freight rates for goods shipped over the road. UPS is the nation’s largest intermodal shipper and Ken Buenker, transportation manager, says the company is pleased with rail service overall, but has concerns in a few areas. Jonathan Krystek, chief operating officer of Knichel Logistics in Gibsonia, Pa., said intermodal volume has remained strong after the peak in October and added that the company had “not seen at all” the dropoff in volume typical of January. Some railroads have cut back on lanes and, in some cases, reduced the frequency of their service, but Krystek and other industry executives say they do not expect the changes to seriously limit the growth of intermodal in 2018. 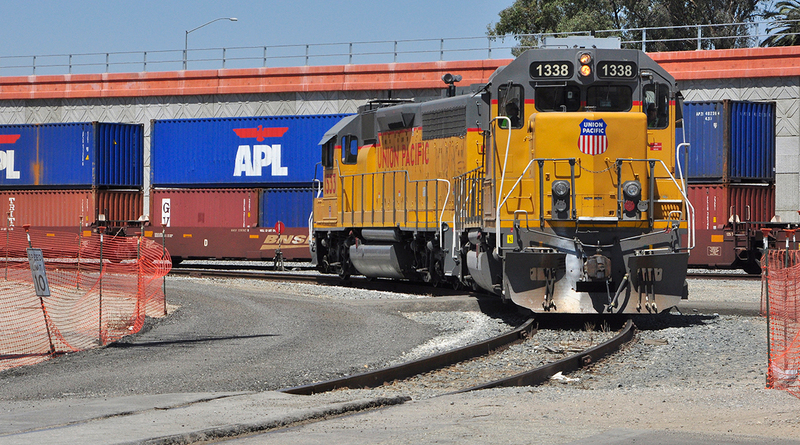 Larry Henry, vice president of logistics and special projects for Alliance Shippers in Orland Park, Ill., said most rail carriers are planning to expand capacity to handle additional intermodal volume. Service levels vary widely, however, with the percentage of on-time intermodal shipments for its customers ranging from near 100% for BNSF and Kansas City Southern to the low- to mid-70% range for CSX. A key factor for railroads attempting to take more freight from trucks will be the ability to provide more consistent service, said Todd Tranausky, a senior transportation analyst for FTR Transportation Intelligence in Bloomington, Ind. In a published report for clients, Tranausky noted that intermodal train speeds are below their 10-year historical average at all but two of the seven Class 1 railroads, with Union Pacific and Kansas City Southern the only ones with trains moving faster now than they have on average over the past decade. Another concern, Alliance’s Henry said, is the potential for increased congestion and delays due to a shortage of drivers and a lack of equipment at some intermodal terminal locations. Ben Cubitt, an executive with Transplace Inc. in Frisco, Texas, said while shortages of containers at some intermodal terminals might frustrate intermodal shippers, he sees no end to the growth of intermodal volume as long as the economy remains strong. In the IANA report, the size of the domestic container fleet is expected to grow by 4.3% in 2018 compared with a 2.7% increase in 2017, based on a survey conducted by railcar provider TTX. An analysis of major intermodal corridors shows eastern-western Canada growing the fastest with a 12.7% increase in volume in the fourth quarter. Only two other lanes, the Northeast-Midwest and South Central-Southwest, had growth of 5% with growth in other lanes below 3%. Volume in the Midwest-Northwest actually shrank 5.2% in the final quarter, IANA reported. In the year ahead, international growth is likely to slow and domestic growth is expected to accelerate, in part, because of tight trucking capacity.